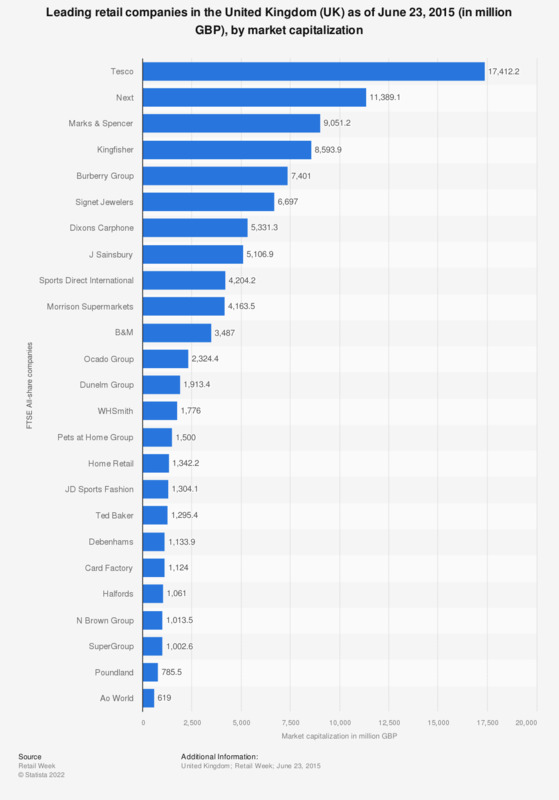 This statistic displays a ranking of retail companies trading on the London Stock Exchange, by their market capitalization, as closing time on June 23, 2015. Tesco ranked highest with a market capitalization of 17.4 billion British pounds, followed by Next at approximately 11.4 million British pounds. Figures are as at close June 23, 2015. In the investment community, market capitalization is used to measure a company's size. It represents the market value of all of a company's outstanding shares, calculated by multiplying a company's shares outstanding by the current market price of one share.